Also living in our tank is a school of guppies. 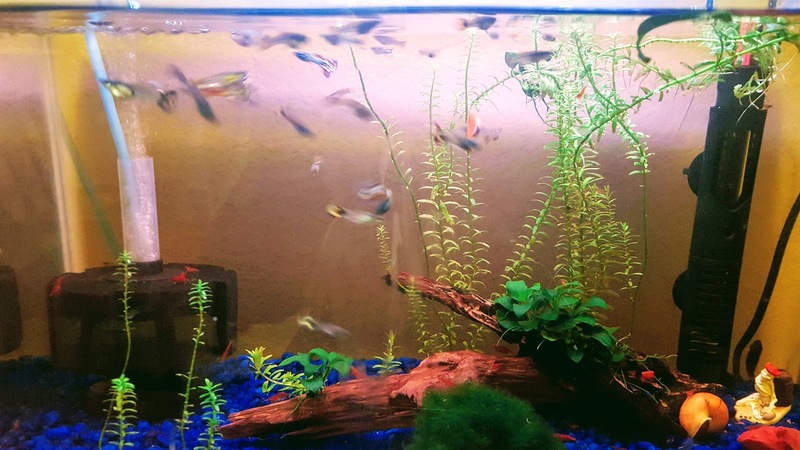 They started out as 3 ahem male guppies but apparently a mistake was made because now there are 30 of them. 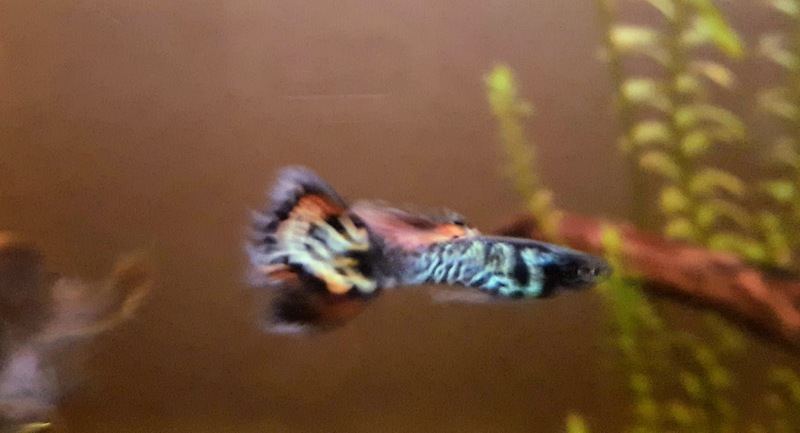 I am desperately trying to give away as many as possible now that they are growing bigger because our little 10 gallon tank is not equipped to deal with that many fish! 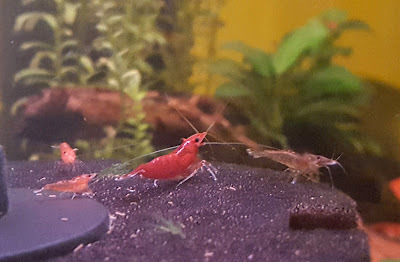 The other inhabitants include a yellow mystery snail (fun to watch, and lays a clutch of eggs every few weeks), 2 otocinclus catfish (these are Jack's favorite, and the first fish we bought after our tank was ready) and 2 big amano shrimps (my least favorite, since they look like the kind that you eat and are just big and gray and bug-looking). It is a planted tank with several live plants that seem to be doing well when the guppies aren't nibbling on them. The care of this tank mostly falls to me, though I have my little grunts do most of the grunt work of bringing me the bucket and siphon, dumping out the gross water, filling the bucket with clean hose water (which I then dechlorinate and heat up using the tank's little heater) and of course putting everything away after. How did we survive without a siphon for our fish tank when I was growing up?? I pretty much always had a fish tank in my house as a kid and teenager, (and even a turtle tank) and I remember HATING cleaning it. With the siphon and a big 5 gallon bucket, it's really not that hard! The best part is that Jack loves it though. 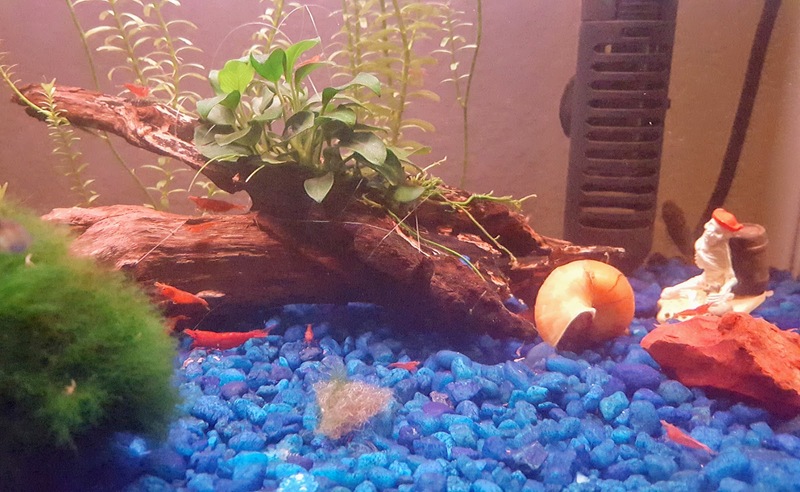 My aspiring marine biologist spends many hours watching his tank, drawing the inhabitants, and researching them (supervised) on the internet. One of his favorite things to do with his tablet that he got for Christmas is to film "vlogs" telling people about his fish tank. They are silly, creative, and hilarious. Maybe he has a future on youtube!